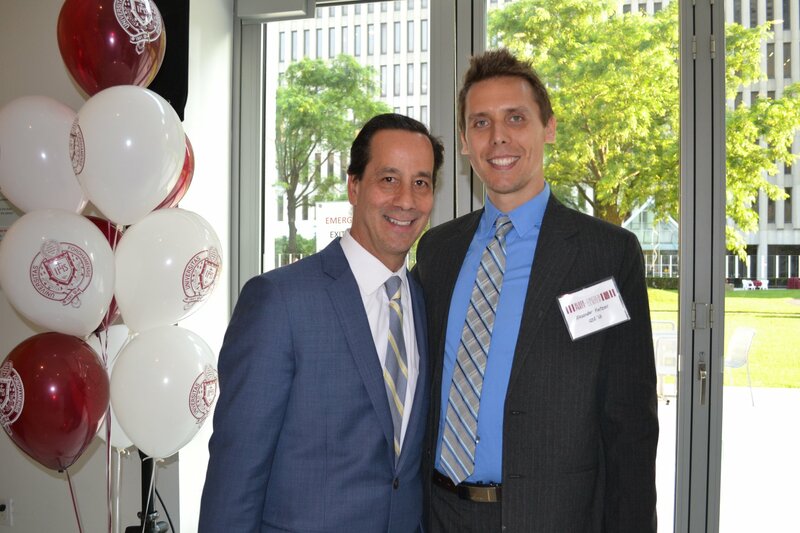 The Graduate School of Education (GSE) held its third annual reunion party on June 7 as part of Fordham University’s Block Party at Lincoln Center 2018. With Manhattan as the backdrop and wonderful weather, GSE alumni and faculty came together to celebrate memories, rekindle friendships, and network. It was also used as the platform to present the GSE’s reinstated “Young Rising Star” award. Dean Virginia Roach opened the evening by thanking everyone for attending this special night, where alumni could reconnect with faculty and colleagues, meet new colleagues, broaden their professional network, as well as have fun. Dean Roach added that the school’s “Young Rising Star” award is presented to an alum who graduated from the GSE in the most recent five years. This person is nominated for outstanding achievements as an early-career professional which could be in a number of categories, including professional practice, leadership, research, service to the field, innovations in their chosen profession, or an integration of several aspects of excellence. 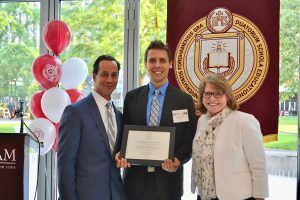 The much-anticipated 2018 Young Rising Star recipient was Alexander W. Fietzer, Ph.D., a 2013 graduate of the Counseling Psychology program. Presenting the award was Fietzer’s dissertation mentor and incoming chair of the Division of Psychological and Educational Services, Joseph Ponterotto, Ph.D.
Fietzer thanked everyone for the award and humbly expressed how grateful he was to be chosen. The GSE portion of Block Party 2018 concluded with remarks by Stephen Freedman, Ph.D., Provost of Fordham University, and the Reverend Joseph McShane, S.J., 32nd President of Fordham University. Both thanked Dean Roach for the wonderful work that she has done in reimagining and bringing new enthusiasm to the Graduate School of Education. To view the 3rd Annual GSE Reunion video, click here.